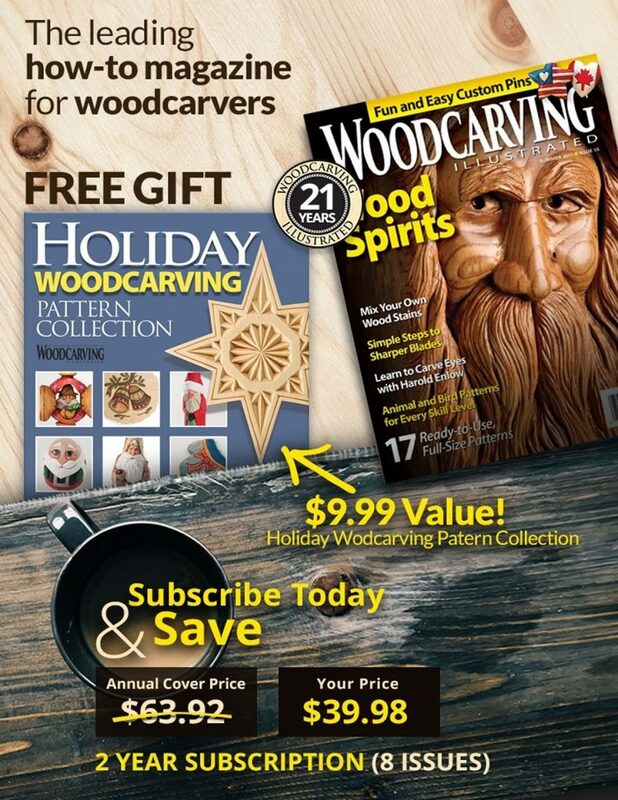 Most carvings of people will include some sort of hair, whether it is hair on the head, a mustache, or a beard. Hair is one place where you can introduce a bit of realism to make the caricature parts stand out. Basic hair is really a series of carved grooves. 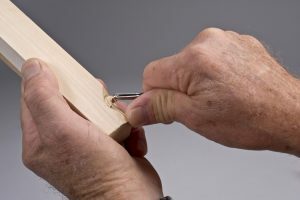 There are a few more steps to carving a curled lock, or curlicue, of hair. I use a V-tool for men’s hair because it looks rugged. It can also look stringier. For women’s hair, I use a small #11 gouge. 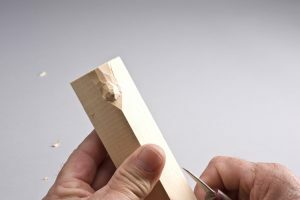 This gouge allows you to carve more flowing locks of hair. Step 1: Round the corner of the blank. Hair wraps around the head, so the base under the hair should be round. 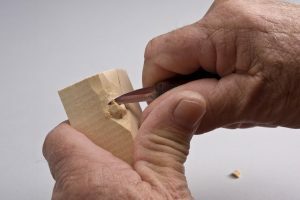 Use a carving knife to round the blank. Step 2: Carve the hair. 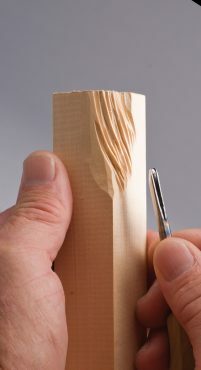 For a man’s hair, carve a series of curved lines with a 1/8″ (3mm) V-tool. Use a small veiner to carve a woman’s hair. Make sure there are no straight lines. Straight lines look too static. Eliminate flat spots by carving between two nearby hairs wherever there is a flat spot. Deepen some cuts to create more shadow. Step 3: Clean out the fuzzies. Use a denture brush to scrub out any small fuzzies. Make light cuts with the V-tool or veiner to clean up any rough cuts. Step 1: Carve an oblong lump. I call this “carving a grape.” Round the corner of the block. Make a stop cut above and below the curl, and cut up to the stop cut to separate the curl from the background hair. 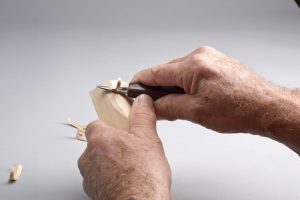 Round the edges of the curl to make the oblong lump. 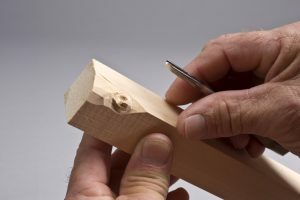 Step 2: Carve the center of the curl. I call this “making a doughnut.” Use a small veiner to carve a groove in the top right quadrant of the lump. Step 3: Carve the area where the curl overlaps. I call this “making a lock (split) washer.” Make a stop cut on one side of the doughnut with a carving knife. Carve up to the stop cut to separate the tip of the curl from the rest of the hair. This creates a visible curl on the end of the lock of hair. Step 4: Create the curl. 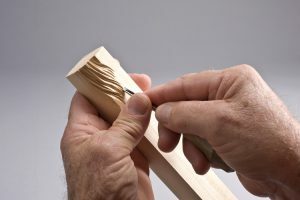 Use a 1/8″ (3mm) V-tool to undercut the edges of the top curl and to roughly shape the sides of the curl. 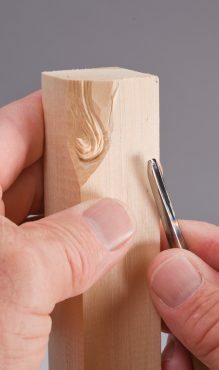 Then, use the same tool to begin carving some lines representing hair into the curl. Start at the curl and work up toward the top of the blank. Step 5: Separate the curl from the background. 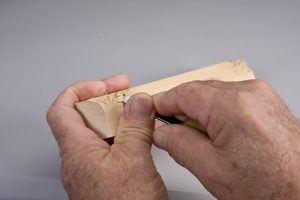 Make a stop cut around the curl with a 1/4″ (6mm) #3 gouge. Cut up to the stop cut with the same tool to isolate the curl from the rest of the hair. Step 6: Refine the hair texture. Use the 1/8″ (3mm) V-tool. 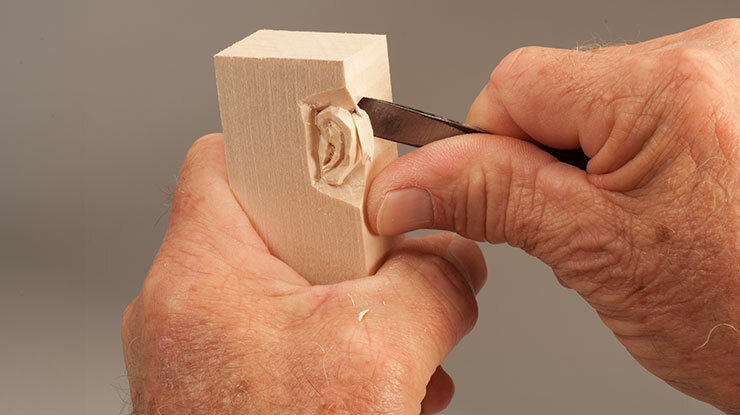 Carve around to the tip of the curl. 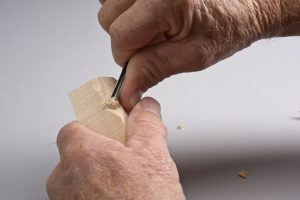 Be careful when you are cutting across the grain because the wood will be more fragile and you can break away the hair texture. 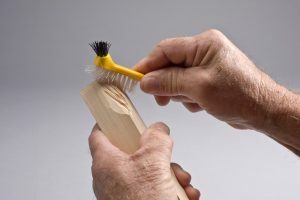 Use a denture brush to remove any fuzzies. 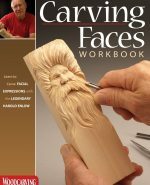 For more information see Carving Faces Workbook by Harold Enlow. 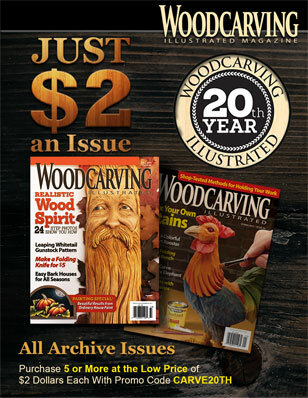 Pull up a seat next to Harold’s carving bench as he teaches you how to carve faces with highly detailed eyes, lips, nose, hair, and ears, while sharing decades of carving tips and techniques. The book is available from www.FoxChapelPublishing.com for $19.95 plus S&H.